Calciphylaxis is a rare condition characterized by the emergence of non-healing skin ulcers secondary to arterial calcification and thrombosis, typically diagnosed in patients with end-stage kidney disease (ESKD). When it develops in patients without ESKD, it is called non-uremic calciphylaxis (NUC). The latter is an even rarer diagnosis with an uncertain pathophysiology and a high mortality rate (52%), mainly due to sepsis (50%). Cutaneous biopsy is diagnostic. Therapeutic measures recommended for NUC are limited to wound debridement, analgesia, and control of infection and risk factors. Other therapeutic options exist but with a low level of evidence. We present the case of a 78-year-old woman with NUC in her lower limbs who died of sepsis. NUC is a therapeutic challenge lacking efficient strategies. Nigwekar SU, Kroshinsky D, Nazarian RM, Goverman J, Malhotra R, Jackson VA, et al. 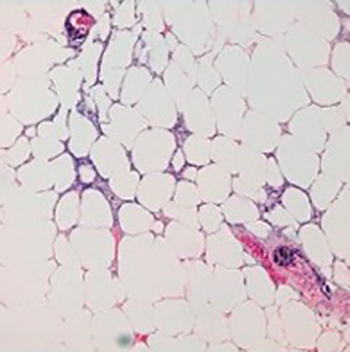 Calciphylaxis: risk factors, diagnosis, and treatment. Am J Kidney Dis 2015;66:133–146. Nigwekar SU, Wolf M, Sterns RH, Hix JK. Calciphylaxis from nonuremic causes: a systematic review. Clin J Am Soc Nephrol 2008;3:1139–1143. Wollina U. Update on cutaneous calciphylaxis. Indian J Dermatol 2013;58:87–92. Lee JL, Naguwa SM, Cheema G, Gershwin ME. Recognizing calcific uremic arteriolopathy in autoimmune disease: an emerging mimicker of vasculitis. Autoimmun Rev 2008;7:638–643. Marques SA, Kakuda AC, Mendaçolli TJ, Abbade LP, Marques ME. Calciphylaxis: a rare but potentially fatal event of chronic kidney disease. Case report. An Bras Dermatol 2013;88(6 Suppl 1):44–47. Weenig RH. Pathogenesis of calciphylaxis: Hans Selye to nuclear factor kappa-B. J Am Acad Dermatol 2008;58:458–471. Schlieper G, Brandenburg V, Ketteler M, Floege J. Sodium thiosulfate in the treatment of calcific uremic arteriolopathy. Nat Rev Nephrol 2009;5:539–543. Vedvyas C, Winterfield LS, Vleugels RA. Calciphylaxis: a systematic review of existing and emerging therapies. J Am Acad Dermatol 2012;67:e253–260. ISRCTN registry. ISRCTN73380053: A clinical trial with sodium thiosulfate for the treatment of calciphylaxis. Available from http://www.isrctn.com/ (accessed 13 Nov 2015). Arenas MD, Gil MT, Gutiérrez MD, Malek T, Moledous A, Salinas A, Alvarez-Ude F. Management of calcific uremic arteriolopathy (calciphylaxis) with a combination of treatments, including hyperbaric oxygen therapy. Clin Nephrol 2008;70:261–264. Chan MR, Ghandour F, Murali NS, Washburn M, Astor BC. Pilot study of the effect of lanthanum carbonate (Fosrenol®) in patients with calciphylaxis: a Wisconsin Network for Health Research (WiNHR) study. J Nephrol Ther 2014;4:1000162. Nigwekar SU, Bhan I, Turchin A, Skentzos SC, Hajhosseiny R, Steele D, Nazarian RM, et al. Statin use and calcific uremic arteriolopathy: a matched case-control study. Am J Nephrol 2013;37:325–332. Ross EA. Evolution of treatment strategies for calciphylaxis. Am J Nephrol 2011;34:460–467. Salmhofer H, Franzen M, Hitzl W, Koller J, Kreymann B, Fend F, et al. Multi-modal treatment of calciphylaxis with sodium-thiosulfate, cinacalcet and sevelamer including long-term data. Kidney Blood Press Res 2013;37:346–359. el-Azhary RA, Arthur AK, Davis MD, McEvoy MT, Gibson LE, Weaver AL, et al. Retrospective analysis of tissue plasminogen activator as an adjuvant treatment for calciphylaxis. JAMA Dermatol 2013;149:63–67.